The MET Drone’s unique wide body, aerodynamic design directs the flow of air, greatly decreasing turbulence and drag, allowing for that precious increase in rider speed. The Drone does this with an added volume design on the helmet’s sides that guide air over the rider’s shoulders, a natural area of turbulence that creates wind resistance and drag. A system of internal air channels maximize cooling while guiding haeated air away from your head without sacrificing aerodynamic function. The purpose-built MAG-CLIP Shield maximizes aerodynamics, creating a unique drop shape. The powerful, low-profile neodymium magnetic clips hold the visor securely in place when attached to the helmet body, with no aerodynamic sacrifice, and no danger of vibration misalignment. The soft nose bridge keeps the visor fingerprint free, and an anti-fog coating ensures visor clarity. Safe-T Advanced, MET’s top of the line fit system, provides the best weight and comfort ratio. The contact points have a larger cradle surface increasing comfort, keeping weight low and allowing perspiration at the back of the head. The polyurethane soft padding improves fit, affording a comfy head touch. The straps on the Drone Wide Body are made to aid sweat evaporation and to provide greater tensile strength with less weight. 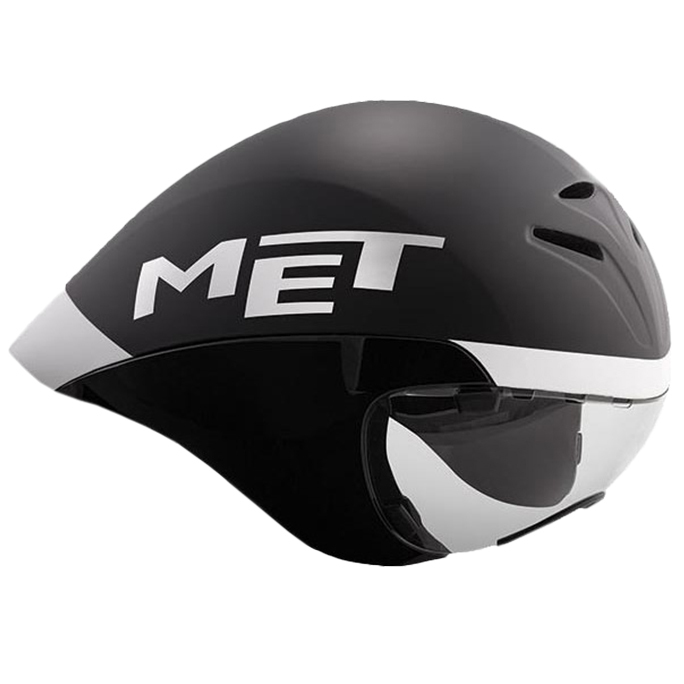 The MET Drone’s strap anchor points are embedded in the polystyrene, a technical feature that improves aerodynamics by leaving the shell exterior free from edges that might disrupt airflow. This is a great helmet, especially for someone like myself who has broad shoulders. It is light and comfortable, and the airflow is surprisingly good. It is also very quiet when riding with the helmet on, suggesting very good aerodynamics. The magnetic clips for the visor work great as well. I'm more pleased with this helmet than expected. I often have difficulty fitting bicycle and motorcycle helmets. The large Drone adjusted quickly and easily such that the fit is comfortable and secure. Very light, no pressure points. Excellent air flow - remained comfortable even on hot, humid days. No obstruction to vision, no interference while in aero, and no buffeting on head turns. Best helmet I have ever used. Product description and info 100% spot on. Excellent value for money I think. Good looking helmet. The vision is much wider than my older LG. Look forward to trying it in a race. The wide design helps with better ventilation here in hot Florida.